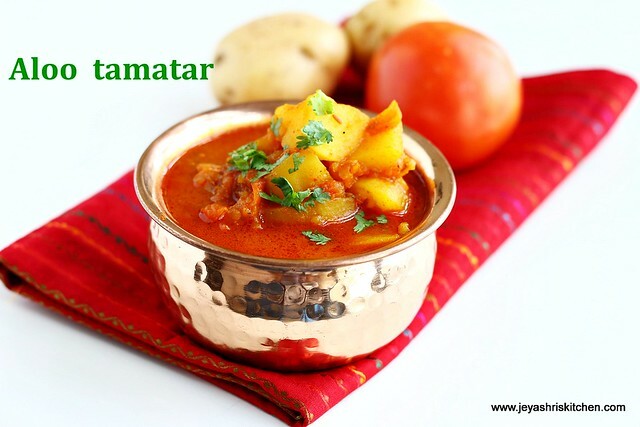 Aloo tamatar sabzi is a super quick and simple recipe made with potato and tomato as main ingredient. I have given this recipe in Aval Vikatan supplement which got published in august 2014. Since it is navratri fasting for many North Indians, i thought it is the right time to post this recipe. I am sure about the exact rules and regulations followed during navratri but as i know onion and garlic will not be included in the food. Even if you don't have any vegetable at home simple potatoes can make this yummy sabzi. 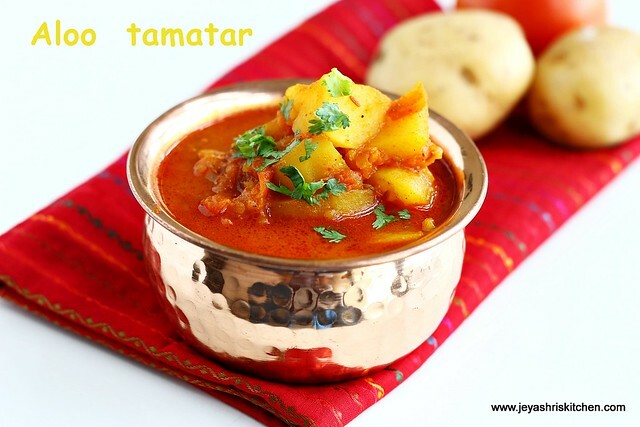 Aloo tamatar is a perfect side dish for poori, chapathi|roti, and jeera rice or any pulaos. Chop the tomatoes into small pieces and potatoes into cubes. In a pressure cooker add oil and throw in the cumin seeds. Add in the tomatoes and saute for a minute. Add in the red chili powder, cumin powder and garam masala. 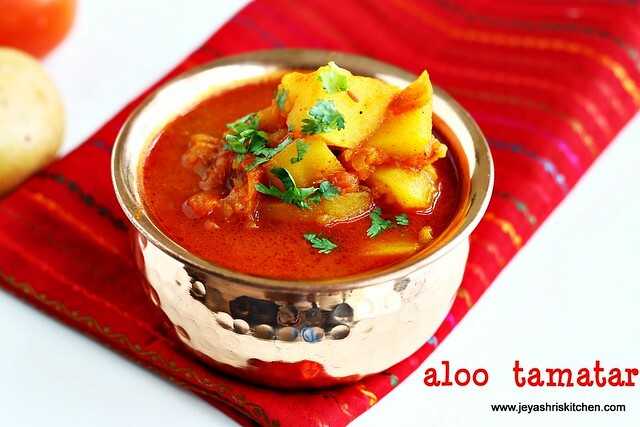 Aloo tamatar is ready. Garnish with coriander leaves. If it is too thick you can add little water and bring it to boil. If you find this is bit thin, mash few potatoes and bring it to boil. If you want to make it a onion garlic version, add ginger garlic paste after adding cumin seeds. Finely chopped onions can be added before adding tomatoes. perfect with roti / pulao!!! love the rich color you have got!! Very tasty n I made first time. Thank u jaya Sri.. I tasted this in 2002 but don't know it's name or anything. So I can't ask my mom to do cos my school Jain friends brought it.. U made my day, thanks for posting it.